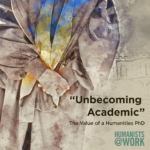 For most of those who have devoted the better part of a decade to earning a PhD in the humanities, a doctoral degree and the experience of earning it holds a deep, inherent value. And yet, higher education struggles to articulate the nature of that value, often resorting to traditional economic notions of earnings and transferrable skills. In this podcast, we explore the concept of value as it is defined within multiple disciplines and contexts.